The Chummery Estate, originally built for the chairman of Macy’s, is the epitomy of sophisticated and casually elegant island living. Features include a drawing and dining room overlooking the Junior Olympic size pool, adjacent to a gourmet kitchen. The family room offers ample space as an office, a media room, or a cooling retreat on a warm summer day. The recently built pool gives you the opportunity for a refreshing swim in the morning or even under the magnificent moonlit evening sky. The patio surrounding the pool is an impressive venue and a romantic spot for a quiet dinner at home. The pool cabana gives a shaded seat for afternoon refreshments, or for a morning workout. The Estate is beautifully appointed with 2 spacious master suites both with private balconies overlooking the herb gardens. The current owners have carefully planted the gardens which are perfect for an afternoon stroll and a cup of tea under the gazebo. For guests you will find 2 full guest suites on the lower level, with direct access to the pool area and gardens. Adjacent to the bedrooms, there is a fully equipped exercise room and room for an optional third guest suite. The Chummery Estate represents one of the finest privately held botanical offerings on the Island of Barbados. The gardens were carefully planned and executed with precision; the perfect backdrop for strolling on the tranquil paths, or enjoying a cup of tea in the cooling Palm Thatched Hut. 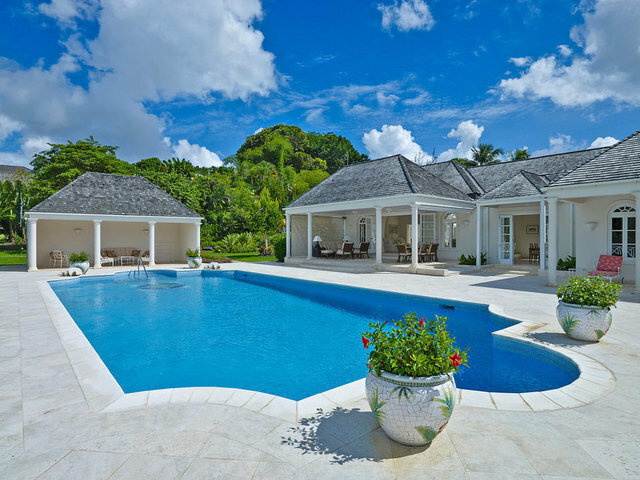 The grounds are one of the largest estates on the Sandy Lane Estate, with three fully combined (and dividable) lots. This incredible offering gives you the utmost privacy for your island retreat, or the opportunity for new development.